The good twin stayed close to her Chicago home. She found a nice, albeit taupe mate named Aris, whom she plans to marry. They live together in a little loft in Chicago. She has a college degree. She makes nice with her parents and is still malleable in their hands. She’s also got a wicked case of the runs. 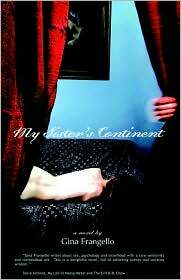 Gina Frangello’s debut novel My Sister’s Continent is an oozing, gooey mess of plop and slop about family and family secrets and memories, bodies, and pain. It’s written as a modern take on Freud’s “Dora” case study, but having just a Wikipedia-sized knowledge of the controversial study doesn’t seem to detract from the story. Two years after the disappearance of her twin sister, Kendra, Kirby responds to a case study written by her own analyst, in which she believes she was mis-represented. She doubles back to tell about the 10 months, during which she was a ?patient-no-client of the doctor, in her own words and alternately in her sister’s words, using old journals to fill in gaps. Kendra returns to Chicago after a back injury makes it impossible to continue on with the New York City Ballet, where she is a dancer. She is a prickly sort, as prone to tantrums as Kirby is to tears. Her return is a messy mix of starvation, chemical cocktails, diddling with the exboyfriend she originally swiped from Kirby, and an eventual sexual relationship with her father’s partner Michael Kelsey, a man whose taste runs toward ladies who are bound, gagged, splayed, burned, and whipped. ?Kendra has some ill will toward her parents, which intensifies when it is revealed that her father has AIDS. Kirby acts as an intermediary between Kendra and the family, but has her own stuff going on. Namely that she has gone gaga for Michael Kelsey’s ex-wife, also a friend of the family, who had an affair with her father and is now making Kirby’s wedding dress. This book is intense. There were points where my jaw dropped at the raw realness of Frangello’s super complete characters and the detailed descriptions and her total control over the subject. What an honest, unflinching writer. This was most surprising because I was struggling to get into the book. The “Dora” link kept me from picking it up in the first place, not being familiar with the case study. And the opening bits didn’t grab me, introducing this as a missive to a former analyst. But as soon as Kendra lands at the airport, this novel becomes un-put-down-able. Frangello writes like the opposite of a person who carries hand sanitizer in her purse. She writes like a person who would dive face-first into a vat of mystery meat to find out what makes it that color. She writes like no one is watching, when really everyone should be. I don’t think I can adequately convey how happy it makes me that you loved this book. Oh yeah. Big, big fan. Good job paving the way on this one. This has been on my wish list since you shared her essay about her mother-in-law’s response to the book. Also: She seems to be in cahoots with Lidia Yuknavitch, who wrote “The Chronology of Water.” I liked that one, too.